Dragonslaying might the most pervasive and universal myth among all human cultures. Gilgamesh and Enkidu killed Humbaba the 'terror of all humanity' in the middle east. 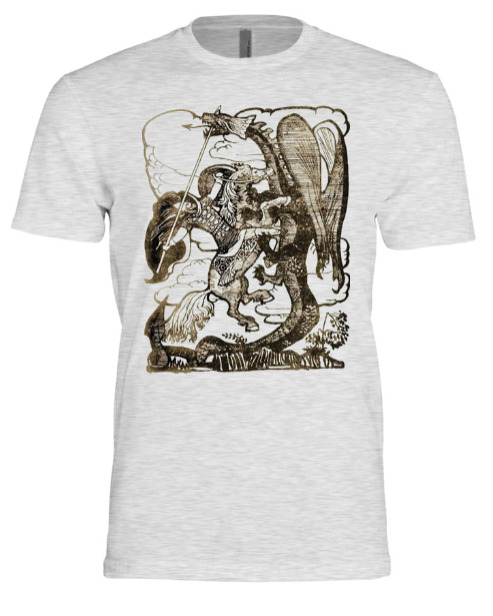 Beowulf killed the dragon Western Europe in the Anglo-Saxon tale. Perseus defeated a number of dragons on his quests through the Mediterranean. Tokoyo slays a dragon she finds in an underground cave after trying to restore the honor of her father in Japan. Grootslang the giant serpent slumbered under the African seas and was only defeated by the Gods as they split it's mighty power in two, creating the first snakes and elephants. Supersoft triblend crew t-shirt. Casual, comfortable and modern slim cut. Set-in 1x1 baby rib collar.